LAST YEAR’S PROVINCIAL budget included the continuation of the Risk Management Program (RMP), with $100 million in available funding each year. 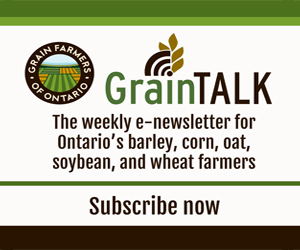 To ensure that all producers who trigger payments at different times during the year have equal access to the funding, an interim payment rate was used to calculate pre-harvest payments for grains and oilseeds producers. The interim payment rate is based on the (support level – market price) x 40% and takes into account the available funding. The market price is based on the average of future delivery prices or forward contract prices for six months prior to harvest. Payment rates may be adjusted throughout the year. If you have any questions about payments, you should contact Agricorp at contact@agricorp.com or call 1-888-247-4999. Post-harvest payments and any pre-harvest adjustments will be made in June. The post-harvest payment is based on the average of cash or spot prices for six months during and after harvest. Post-harvest RMP payments are counted as an advance on the provincial portion of your AgriStability payment for the corresponding program year. You keep the greater of either the RMP payment or the provincial portion of the AgriStability payment. For pre-harvest, there are generally no AgriStability offsets. Because RMP is provincially funded, it has no impact on the federal portion of AgriStability payments.